Whilst we have made every effort to ensure that the content of this website is as accurate as possible we do not guarantee the content will be free of errors. To the fullest extent permitted at law we shall not be liable for any kind of loss or damage from action taken or reliance placed on information contained on this website. Any order for goods placed through our website shall be subject to these Terms and Conditions. All other Terms and Conditions expressed or implied by statute or otherwise are excluded to the fullest extent permitted by law. Nothing in these Terms and Conditions is intended to limit any rights you might have as a consumer under any applicable law or other statutory rights that may not be excluded. Orders over £150 qualify for free delivery, with exceptions to this for bulky or oversized items. Some items under £150 are also eligible for free delivery, and this is marked on the product page. You will be notified of the delivery cost at checkout. If a charge is required, delivery prices generally range from £5.50 to £7.00 depending on the product, but please note an additional surcharge is required for certain postcodes (island locations, Scottish Highlands and remote areas). Bulky items may also incur an extra charge for which you will be notified beforehand. Products will be delivered boxed. Delivery times are calculated in working days- i.e. Monday to Friday inclusive (working days do not include weekends or National Bank Holidays). In case of Bank Holidays please allow an extra 2 working days. From the receipt of your order we will endeavour to deliver your chosen items to you within 7 working days providing the goods are in stock, unless a longer delivery time is shown on the product information page. Deliveries to non-mainland or remote locations may take longer. Goods delivered by courier should usually arrive between 9 am and 5 pm, Monday to Friday. All products are covered by a full manufacturer's warranty, the period of which varies according to the product. The warranty period starts from the date of purchase and some are conditional on the product being serviced at the recommended intervals by an approved dealer. To repair or replace any goods that are damaged or defective; or if repair to or replacement of the goods is not possible, or the cost of repair or replacement is disproportionate in the circumstances, to give you a partial or full refund for the goods in question, depending on what is reasonable in the circumstances. Garden Machinery Direct work in partnership with Sage Pay to ensure all information you give us during the order process is encrypted before transmission via the World Wide Web. If any other Internet user should intercept the communication they will only be able to see it in the encrypted form. Visit www.sagepay.com for more information. 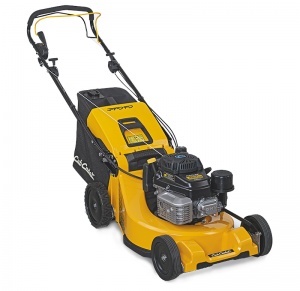 The prices shown are only applicable to purchases made via the Garden Machinery Direct Website. Prices in our stores may vary to those shown on the website. Special offers and promotions advertised in the press or other media may be excluded unless specifically advertised as available online. All prices are correct at time of display online and include V.A.T where appropriate. We regret we are not able to offer VAT exclusive pricing for deliveries to the Channel Islands. In the unlikely event of an administrative error resulting in an incorrect price being displayed, we reserve the right to correct the price. In these circumstances, you will not be bound to continue with your purchase, and will be asked to email us to confirm that you wish to proceed. You may cancel your contract with us for the goods you order at any time up to the end of the fourteenth day from the date you receive the ordered goods, which must be in writing or by e-mail. If you have received the goods before you cancel your contract then, you must send the goods back unused and in their original packaging or in a suitable box/packaging to the address specified by us, at your own cost and risk and within fourteen days from the point at which you notify us of the cancellation. If you cancel your contract but we have already processed the goods for delivery you must not unpack the goods when they are received by you and you must send the goods back to us at the address specified by us, at your own cost and risk as soon as possible. Once you have notified us that you are cancelling your contract, any sum deducted by us for the products from your payment card will be re-credited to your account as soon as possible provided that the goods in question are returned by you in the condition they were in when delivered to you. We regret that delivery charges where applicable are non-refundable. If you do not return the goods or pay the cost of return delivery, we shall be entitled to deduct the direct costs of recovering the goods from the amount to be re-credited to you. Where goods are not faulty but the customer wishes to return them, the goods can only be returned to the company if fully re-saleable, being unopened with any original manufacturers seals or shrink wrap in place, within fourteen days. Such returns will be subject to a restocking charge of 25% of the original purchase price. You will be under a duty to take reasonable care to see that returned goods are well packaged, so to avoid damage in transit. An appropriate method of return should be used. All goods are returned at your own cost. When returning any petrol powered product all oil and petrol MUST be drained from the engine before you release the goods to a carrier. This is for the safety of the carrier firm. "Garden Machinery Direct " is a trading name of Ron Smith & Company Limited, registered Head Office, 4 Newtown Road, Worcester, WR5 1HF. Registered in England No 3737380. VAT 275 0872 42.